Alpha ATROX is a line of rugged UPS power systems used worldwide in the most demanding environments where clean backup power is needed. Designed to perform in the most extreme demanding environments, Alpha ATROX ensure equipment in security, communications, traffic, industrial environments, and many other critical applications remains safe and protected from power disturbances. Thanks to its powerful programmable battery charger, the ATROX is capable of providing the runtime you need. 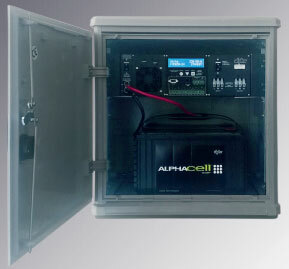 Alpha ATROX provides clean uninterrupted backup power in a compact all-in-one IP44, keylocked and vandal resistant enclosure. ATROX comes along with cycle-proof, deep-discharge-proof and maintenance-free 10-12 design life GEL batteries.